The Golden State Warriors are an American professional basketball team based in Oakland, California. The Warriors compete in the National Basketball Association (NBA), as a member of the league's Western Conference Pacific Division. Founded in 1946 in Philadelphia, the Warriors relocated to the San Francisco Bay Area in 1962 and took the city's name, before changing its geographic moniker to Golden State in 1971. [b] They play their home games at the Oracle Arena. The Warriors won the inaugural Basketball Association of America (BAA) championship in 1947,[c] and won its second championship in 1956, led by Hall of Fame trio Paul Arizin, Tom Gola, and Neil Johnston. However, the Warriors would not return to similar heights in Philadelphia, and after a brief rebuilding period following the trade of star Wilt Chamberlain, the team moved to San Francisco. With star players Jamaal Wilkes and Rick Barry, the Warriors returned to title contention, and won their third championship in 1975, in what is largely considered one of the biggest upsets in NBA history. This would precede another period of struggle in the 1980s, before becoming playoff regulars at the turn of the decade with stars Tim Hardaway, Mitch Richmond, and Chris Mullin, colloquially referred to as "Run TMC". After failing to capture a championship, the team entered another rebuilding phase in the 2000s. The Warriors' fortunes changed in the 2010s, ushering in a new era of success led by Stephen Curry. After drafting perennial All-Stars Klay Thompson and Draymond Green, the team returned to championship glory in 2015, before winning another two in 2017 and 2018 with the help of former league MVP Kevin Durant. Nicknamed the Dubs as a shortening of "W's", the Warriors hold several NBA records; they have registered the best ever regular season, most wins in a season (regular season and postseason combined), as well as the best ever postseason run. With the combined shooting of Curry and Thompson, they are credited as one of the greatest backcourts of all time. The team's six NBA championships are tied for third-most in NBA history with the Chicago Bulls. According to Forbes, the Warriors are the seventh highest valued sports franchise in the United States, and joint-tenth in the world, with an estimated value of approximately $3.1 billion. The Warriors were founded in 1946 as the Philadelphia Warriors, a charter member of the Basketball Association of America. They were owned by Peter A. Tyrrell, who also owned the Philadelphia Rockets of the American Hockey League. Tyrrell hired Eddie Gottlieb, a longtime basketball promoter in the Philadelphia area, as coach and general manager. The owners named the team after the Philadelphia Warriors, an old basketball team who played in the American Basketball League in 1925. 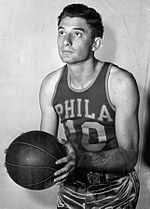 Led by early scoring sensation Joe Fulks, the team won the championship in the league's inaugural 1946–47 season by defeating the Chicago Stags, four games to one. The NBA, which was created by a 1949 merger, officially recognizes that as its own first championship. [c] Gottlieb bought the team in 1951. The Warriors won its next championship in Philadelphia in the 1955–56 season, defeating the Fort Wayne Pistons four games to one. The Warrior stars of this era were future Hall of Famers Paul Arizin, Tom Gola and Neil Johnston. In 1959, the team signed draft pick Wilt Chamberlain. Known as "Wilt the Stilt", he led the team in scoring six times, quickly began shattering NBA scoring records and changed the NBA style of play forever. On March 2, 1962, in a Warrior "home" game played on a neutral court in Hershey, Pennsylvania, Chamberlain scored 100 points against the New York Knicks, a single-game record the NBA ranks among its finest moments. In 1962, Franklin Mieuli purchased the majority shares of the team and relocated the franchise to the San Francisco Bay Area, renaming them the San Francisco Warriors. The Warriors played most of their home games at the Cow Palace in Daly City (the facility lies just south of the San Francisco city limits) from 1962 to 1964 and the San Francisco Civic Auditorium from 1964 to 1966, though occasionally playing home games in nearby cities such as Oakland and San Jose. Prior to the 1963–64 NBA season, the Warriors drafted big man Nate Thurmond to go along with Chamberlain. The Warriors won the Western Division crown that season, but lost the 1964 NBA Finals to the Boston Celtics, four games to one. In the 1964–65 season, the Warriors traded Chamberlain to the Philadelphia 76ers for Connie Dierking, Lee Shaffer, Paul Neumann and $150,000 and won only 17 games. In 1965, they drafted Rick Barry in the first round who went on to become NBA Rookie of the Year that season and then led the Warriors to the NBA Finals in the 1966–67 season, losing (four games to two) to Chamberlain's new team that had replaced the Warriors in Philadelphia, the 76ers. Angered by management's failure to pay him certain incentive bonuses he felt were due him, Barry sat out the 1967–68 season and signed with the Oakland Oaks of the rival American Basketball Association for the following year, but after four seasons in the ABA rejoined the Warriors in 1972. During Barry's absence, the Warriors were no longer title contenders, and the mantle of leadership fell to Thurmond, Jeff Mullins and Rudy LaRusso. They began scheduling more home games in Oakland with the opening of the Oakland Coliseum Arena in 1966 and the 1970–71 season would be the team's last as the San Francisco Warriors. The franchise adopted its brand name Golden State Warriors prior to the 1971–72 season, in order to suggest that the team represented the entire state of California. [b] Almost all home games were played in Oakland that season; six were played in San Diego, but none in San Francisco or Daly City. Oakland Arena became the team's exclusive home court in 1971. The Warriors made the playoffs from 1971 to 1977 except in 1974, and won their first NBA championship on the West Coast in 1974–75. In what many consider the biggest upset in NBA history, Golden State not only defeated the heavily favored Washington Bullets but humiliated them in a four-game sweep. That team was coached by former Warrior Al Attles, and led on the court by Rick Barry and Jamaal Wilkes. Barry was named Finals MVP. At 59-23, the Warriors had the league's best record during the 1975–76 season. They were upset, however, by the 42–40 Phoenix Suns in seven games in the Western Conference Finals. Due of the loss of key players such as Barry, Wilkes and Thurmond to trades and retirements, the Warriors struggled to put a competitive team on the court from 1978 to 1987 after being one of the NBA's dominant teams in the 1960s and most of the 1970s. 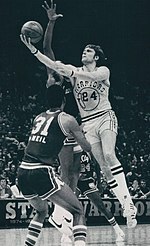 Through the NBA draft, however, they acquired some players such as high-scoring forward Purvis Short (1978), former Purdue center Joe Barry Carroll (1980) and center Robert Parish (1976), who was traded to the Boston Celtics in 1980 along with the draft pick that would become Kevin McHale for the pick used to draft Carroll. In 1983, the Warriors matched the New York Knicks' offer for free-agent Bernard King, but, unable to pay his high salary, quickly traded him to the Knicks for guard Micheal Ray Richardson, whom they soon shipped to New Jersey in exchange for former Georgetown Hoya point guard Eric "Sleepy" Floyd, and journeyman forward Mickey Johnson. Floyd once scored 29 points for the Warriors in the fourth quarter of a playoff game against the Lakers, though he was later traded to the Houston Rockets. The departure of these players for various reasons symbolized the franchise's futility during this period, as head coach Attles moved up to the front office as general manager in 1980 and the team made several coaching changes. New owners Jim Fitzgerald and Dan Finane finally managed to return the team to respectability by hiring former Cleveland Cavaliers head coach George Karl as head coach in 1986 after selecting St. John's small forward Chris Mullin in the 1985 NBA draft. After a subpar stretch in the late 1970s and early 1980s, the team had a brief resurgence under coach Karl, culminating in a 1987 Western Conference Semifinal match against Magic Johnson and the Los Angeles Lakers which is still shown on TV in the NBA's Greatest Games series. In the game, Warriors' All-Star point guard Sleepy Floyd's performance in the second half still stands as the NBA playoff record for points scored in a quarter (29) and in a half (39). His six consecutive field goals in the fourth quarter led to a 51-point finish for him and a victory for the Warriors. The "Sleepy Floyd game" was a catalyst for increased interest in the NBA in the Bay Area which was furthered by new coach Don Nelson, who engineered another successful string of wins in the late 1980s and early 1990s with the high-scoring trio of point guard Tim Hardaway, guard Mitch Richmond and forward Chris Mullin (collectively known as "Run TMC" after the rap group Run-D.M.C.). But "Run TMC" stayed together for only two seasons (winning only one playoff series), when coach Nelson, in a move to get a promising young front-court player to complement his run-and-gun system, sent Richmond to the Sacramento Kings for rookie power forward Billy Owens. Nelson had been brought to the Warriors from the Milwaukee Bucks by Jim Fitzgerald, who along with Dan Finnane owned the team between 1986 and 1995. In 1993–94, with first-round draft pick and Rookie of the Year power forward Chris Webber playing alongside off-guard Latrell Sprewell, the Warriors made the playoffs. At the start of the next season, however, a rift formed between Webber and Sprewell on the one hand and Nelson on the other. All three soon left the team, and the organization went into a tailspin. The 1994–95 season was the first under new team owner Chris Cohan, who had bought out Fitzgerald and Finnane. The Warriors selected power forward prospect Joe Smith as their first overall draft pick in 1995 and hired Rick Adelman as the new head coach. They sent Tim Hardaway and Chris Gatling to the Miami Heat for Kevin Willis and Bimbo Coles midway through the 1995–96 season, and ended up with a 36–46 record, three wins short of making the playoffs. While their home court, the Oakland Coliseum Arena, was being extensively renovated, the 1996–97 Warriors played their home games in the San Jose Arena and struggled to a 30–52 finish. Following the season, Mullin was traded to the Indiana Pacers in exchange for Erick Dampier and Duane Ferrell. Longtime Seton Hall college coach P. J. Carlesimo, who had been recently fired by the Portland Trail Blazers, replaced Adelman as head coach for the 1997–98 season. Sprewell was suspended for the remainder of the season for losing his temper and choking Carlesimo during a team practice in December, generating the glaring newspaper headline "WARRIORS HIT ROCK BOTTOM" and the declaration by general manager Garry St. Jean that Sprewell would never play for the Warriors again. He would not play in the NBA again until he was dealt in January 1999 to the New York Knicks for John Starks, Chris Mills and Terry Cummings. St. Jean had become the new Warriors' general manager in July 1997; he and his predecessor Dave Twardzik received much of the blame for the Warriors' struggles early in Cohan's turbulent tenure as owner in addition to Cohan himself. St. Jean brought in players such as Terry Cummings, John Starks and Mookie Blaylock who were well past their primes. Twardzik drafted several flops, such as Todd Fuller (while Kobe Bryant was still available as well as Steve Nash and Jermaine O'Neal) and Steve Logan (who never played an NBA game). In the following draft, the team selected Adonal Foyle while Tracy McGrady was still available. St. Jean did, however, draft future two-time NBA slam dunk champion off-guard Jason Richardson (from Michigan State), a Warriors' star scorer through the 2006–07 season. For a few years, with rising stars Richardson, small forward Antawn Jamison and point guard Gilbert Arenas leading the team, the Warriors seemed like a team on the rise; but the young Warriors did not have enough in the competitive Western Conference to make the playoffs. After the 2002–03 season, St. Jean's earlier mistakes of committing money to players like Danny Fortson, Adonal Foyle and Erick Dampier were painfully felt by Warriors' fans when the team was unable to re-sign Arenas despite his desire to stay in the Bay Area. A new rule was implemented in response to second-round draft picks who quickly become superstars. Chris Mullin succeeded St. Jean with the title of Executive Vice President of Basketball Operations in 2004. He hoped to build a winning team around Jason Richardson, Mike Dunleavy Jr and Troy Murphy, and drafted 7-foot center Andris Biedriņš from Latvia (11th overall). At the 2005 trading deadline, he bolstered to the team with the acquisition of point guard Baron Davis, bringing to the team its first superstar since Mullin himself. The Warriors enjoyed a great start to the 2005–06 season, entering the new year with a plus .500 winning percentage for the first time since 1994, but managed to win only 13 more games through the end of March due to injuries. Davis often found himself at odds with new head coach Mike Montgomery (used to dealing with college players in his long tenure at Stanford) and failed to remain healthy, playing in just 54 games. On April 5, 2006, the Warriors were officially eliminated from playoff contention in a 114–109 overtime loss to the Hornets, extending their playoff drought to 12 seasons. Entering the 2006–07 season, the Warriors held the active record (12) for the most consecutive seasons without a playoff appearance (see Active NBA non-playoff appearance streaks). During the 2006 off-season, Golden State announced that it had bought out the remaining two years of coach Montgomery's contract and hired previous Golden State and former Dallas Mavericks coach Don Nelson to take over for him. During training camp, small forward Matt Barnes established himself in the rotation. On January 17, 2007, the Warriors traded the disappointing Murphy and Dunleavy with promising young power forward Ike Diogu and Keith McLeod to the Indiana Pacers for forward Al Harrington, forward/guard Stephen Jackson, guard Šarūnas Jasikevičius and forward Josh Powell. This trade allowed the Warriors to "run and gun" their way to the playoffs with a more athletic and talented team. On March 4, 2007, the Warriors suffered a 106–107 loss in Washington, the Wizards handing them their 6th straight loss when former Warrior Arenas hit a technical free throw with less than one second remaining after Nelson had protested a controversial call with the Warriors ahead by a slim margin. The loss dropped them to 26–35. March 4 marked the turning point for the Warriors. The Warriors closed out the regular season (42–40) at 16–5 in their last 21 games. "We Believe" became the Warriors' slogan for the last two months of the season and the playoffs. Led by a healthy Baron Davis, an ever-improving Jason Richardson and young future star off-guard Monta Ellis as well as center Biedriņš, the Warriors immediately dashed the highly favored top-seed Dallas Mavericks' expectations of a short and easy series win with a Game 1 victory in Dallas thanks to Davis' frantic style of play. The Mavericks came back to win Game 2 easily to tie the series at a game apiece, but the Warriors won both Games 3 & 4 with a huge lift from the home crowd at Oracle Arena. A close Game 5 saw the Mavericks eke out a 118–112 victory with a last-minute surge led by superstar forward Dirk Nowitzki to send the series back to California at 3–2. In Game 6, the Warriors engineered a third-quarter 18–0 run to eliminate the Mavericks and become the NBA's first No. 8 seed to beat a No. 1 seed in a seven-game series (and the first NBA No. 8 seed to beat the top seed since 1999 when the New York Knicks eliminated the Miami Heat). It was an upset in name only, given the fact that the Warriors had swept the Mavericks in the regular season series. The Warriors went on to play the Utah Jazz in the second round of the 2006–07 playoffs, where they dropped two close games at EnergySolutions Arena to open the series. The series then shifted to the Oracle Arena, where the Warriors won Game 3 in a convincing blowout. Davis scored 32 points and electrified the crowd with a monster dunk on Jazz forward Andrei Kirilenko late in the fourth quarter, but they lost Game 4 at home, their first loss in Oakland in well over a month and the Jazz closed them out in Game 5 in Salt Lake City. In the 2007–08 season, the Warriors faced early difficulties in their attempt to return to the playoffs. Richardson was traded to the Charlotte Bobcats for rookie Brandan Wright. To make things even worse, Jackson was suspended for seven games over a firearm incident. They opened the season with six straight losses, but Ellis' rise, Davis' solid injury-free season (21.6 points, 8 assists, 4.6 rebounds per game), and an overall improvement in team chemistry brought them back to playoff contention; but in the end the Warriors failed to make the playoffs despite a 48–34 record, which is the best record in NBA history for a non-playoff team since the NBA playoffs had expanded to eight teams per conference. The Western Conference was very strong that season; every playoff team won 50 games, leaving the Warriors two games out of the last playoff spot. The Warriors sold out nearly every home game during the season averaging 19,631 per game, the highest in team history. In the 2008 offseason, Baron Davis opted to return to his home town and sign with the Los Angeles Clippers. With the 14th pick of that year's draft, the Warriors selected and signed Anthony Randolph out of LSU. To compensate for the loss of Davis, the Warriors signed free agents Corey Maggette and Ronny Turiaf and re-signed Ellis and Andris Biedriņš to long-term contracts. The Warriors had a disappointing 2008–09 season, finishing 29–53. Ellis was injured in a moped accident, and suspended for 30 games for riding the vehicle against the terms of his contract, depriving the Warriors of their top player. They traded disenchanted forward Al Harrington to the New York Knicks for guard Jamal Crawford, and were undone by injuries and the minimal experience of their young players such as Anthony Morrow and Brandan Wright. Coach Nelson often had to make adjustments to the starting lineups since many of the original starters missed games due to injuries. Despite the team's losing record, the Warriors were hard to beat when they had a healthy lineup and a strong bench. With leadership and improvement in their young players, they were sometimes able to defeat powerhouse teams such as the Boston Celtics, 99-89. The Warriors chose future superstar point guard Stephen Curry of Davidson College with the seventh overall pick in the 2009 NBA draft. During the 2009 off-season, Warrior ownership declined to renew the contract of general manager Chris Mullin. Larry Riley, Nelson's longtime assistant coach, was promoted in his place; Riley drafted Curry and traded Jamal Crawford to the Atlanta Hawks for Acie Law and Speedy Claxton. The Warriors had another injury-prone year in 2009–10 as they were consistently unable to field their ideal starting lineup. In November, a malcontented Stephen Jackson and seldom-used Acie Law were traded to the Charlotte Bobcats for Raja Bell (out for the season with an injury) and Vladimir Radmanovic. Four days later, they signed center Chris Hunter. Starting in January 2010, they issued multiple 10-day contracts, most notably to power forward Anthony Tolliver from the Idaho Stampede. Due to their multiple injuries, they were granted an exception allowing them to sign Reggie Williams from the Sioux Falls Skyforce to a 10-day contract on March 2. They eventually waived the injured Bell to sign Williams for the rest of the year and finished the season 26–56, failing to make the playoffs. Curry finished second in the NBA Rookie of the Year voting to the Sacramento Kings' Tyreke Evans and was named to the NBA All-Rookie First Team. The Warriors selected Ekpe Udoh, a power forward from Baylor, as the 6th pick of the 2010 NBA draft. They also introduced a modernized version of their "The City" logo depicting the new eastern span of the San Francisco-Oakland Bay Bridge, and switched to a simplified color scheme of royal blue and gold. They also introduced new uniforms reminiscent of the 1969–71 "The City" uniforms. The Warriors made an offseason trade that sent Turiaf, Randolph and Kelenna Azubuike to the New York Knicks in return for star high-scoring power forward David Lee via a sign-and-trade. Lee agreed to a six-year, $80 million deal, on a framework contingent on the decision of superstar forward LeBron James to leave the Cleveland Cavaliers to sign with the Miami Heat that same day. Following Morrow's departure after he signed the New Jersey Nets' offer sheet, the Warriors signed Dorell Wright, formerly with the Miami Heat, to a three-year, $11 million deal. On July 15, 2010, owner Chris Cohan sold the Warriors to Peter Guber of Mandalay Entertainment and his partner Joe Lacob for a then-record $450 million. On November 15, the Warriors announced the new 19-person ownership group composed of Joe Lacob, Peter Guber, Vivek Ranadivé, Erika Glazer, Fred Harman, Bob Piccinini, Larry Bowman, Danny German, Marty Glick, Chad Hurley, Craig R. Johnson, Bruce Karsh, Jeffrey A. Miller, Paul Schaeffer, David Scially, Nick Swinmurn, Harry Tsao, John Walecka and Dennis Wong. The Warriors continued their 2010 offseason signing spree by adding Harvard guard Jeremy Lin to their roster with a one-year partially guaranteed contract containing a second-year team option; Lin became the first Taiwanese-American player in NBA history. Louis Amundson was then added for little under $5 million in mid-September. After coach Don Nelson resigned in September 2010, assistant coach Keith Smart was hired as the team's new head coach. The Warriors won 36 games and failed to make the playoffs in 2010–11. The team broke a franchise record with 21 made three-pointers in a win against the Orlando Magic. In February 2011, the Warriors traded Brandan Wright and Dan Gadzuric for Troy Murphy and a 2011 second-round pick. On February 27, Murphy and the Warriors reached a buyout agreement and he was waived. In April 2011, Dorell Wright made a franchise record of 184 three-pointers in a season in a home win versus Los Angeles Lakers, surpassing Richardson's 183 in 2005–06. In a win against the Portland Trail Blazers, Wright then broke another NBA record, becoming the first player to have scored more points in his seventh season than in all his first six seasons combined. Wright ended the season with the most three-pointers made in the NBA that season with 194, as well as the most three-pointers attempted with 516; each mark set a new Warriors franchise record. Following the season, Curry received the NBA Sportsmanship Award. Coach Smart was dismissed on April 27, 2011 due to the change in ownership. Seventeen-year NBA veteran and former ABC and ESPN commentator Mark Jackson replaced Smart as head coach on June 6. 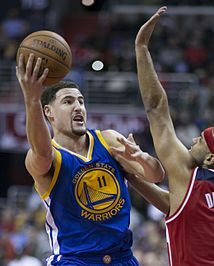 The Warriors selected future All-Star shooting guard Klay Thompson with the 11th pick in the 2011 NBA Draft. However, the team did not improve in the 2011–12 NBA season under coach Jackson, finishing the lockout-shortened season with a 23–43 record (13th in the conference) and again failing to make the playoffs. Due to the 2011 NBA lockout, Jackson could not establish his system in training camp. Hindered by several injuries to key players, the team then entered into another chaotic rebuilding phase. Team leader Monta Ellis was traded in mid-March 2012, along with Kwame Brown and Ekpe Udoh, to the Milwaukee Bucks for center Andrew Bogut (out injured for the season) and former Warrior small forward Stephen Jackson, who without playing a game for the Warriors was quickly traded to the San Antonio Spurs for Richard Jefferson and a conditional first-round pick on March 15. These moves saw the rise of Stephen Curry and David Lee to team co-captains, and saw Thompson move into a starting role. However, Curry suffered a series of ankle and foot-related injuries that limited him to 26 regular-season games. The Warriors' 2012 offseason moves changed the course of the franchise. In the 2012 draft, the Warriors selected small forward Harrison Barnes with the 7th overall pick, center Festus Ezeli with the 30th pick, small forward Draymond Green with the 35th pick, and 7-foot-1 center Ognjen Kuzmic with the 52nd pick. According to sportswriter Anthony Slater, in this draft, "Golden State got a starter [Barnes], a rotation player [Ezeli] and a transcendent talent that perfectly fit the small-ball direction of the league [Green]." In addition, Curry agreed to a four-year, $44 million rookie scale contract extension. At the time, many basketball writers considered the move risky for Golden State because of Curry's injury history. In 2016, however, Slater argued that Curry's relatively inexpensive contract paid "huge dividends" by freeing up the necessary funds to allow the team to "keep a strong core around him". The team made a series of other moves, trading Dorell Wright, obtaining point guard Jarrett Jack, and signing forward Carl Landry. Despite early-season injuries to Brandon Rush and Andrew Bogut, and despite starting two rookies (Barnes and Ezeli), the 2012-2013 Warriors had one of their best starts in decades. The team earned 20 wins in less than 30 games played for the first time since 1992. The Warriors also achieved a milestone by completing their first ever 6–1 road trip in franchise history, including a 97–95 win over the defending champion Heat in Miami. On April 9, 2013, with a win over the Minnesota Timberwolves, the Warriors clinched the playoffs for the second time in 19 years and the first time since the 2006–07 "We Believe" Warriors. This time, the local battle cry was "We Belong". The team finished the season with a record of 47–35, earning the sixth seed in the Western Conference, and defeated the Denver Nuggets in the first round of the playoffs by winning four out of six games. They lost in the second round to the San Antonio Spurs, four games to two. This was the first playoff experience for all of the starters of this group except for Andrew Bogut. Other highlights of the season included Stephen Curry's 272 three-point baskets (an NBA single-season record for the player nicknamed "baby-faced assassin") and the naming of forward David Lee to the 2013 NBA All-Star Game as a reserve, ending the team's 16-year drought without an All Star selection. Curry and Klay Thompson, dubbed the "Splash Brothers" by team employee Brian Witt for their backcourt shooting prowess, combined for 483 three-pointers during the season, easily besting the prior record of 435 set by the Orlando Magic's Nick Anderson and Dennis Scott in 1995–96. During the 2013 offseason, Golden State signed former Denver Nuggets swingman and future NBA Finals MVP Andre Iguodala to a four-year, $48 million deal. To make room under the salary cap, the Warriors traded Richard Jefferson, Andris Biedriņš and Brandon Rush (along with multiple draft picks) to the Utah Jazz. With their lone selection in the 2013 NBA draft, the Warriors made 22-year-old Serbian combo-guard Nemanja Nedovic the 30th and final pick of the first round. Other offseason changes included the departure of free agents Jarrett Jack and Carl Landry and the signings of forward-center Marreese Speights, center Jermaine O'Neal, point guard Toney Douglas, and Serbian center Ognjen Kuzmic. The Warriors began the 2013–14 season showing flashes of brilliance and also plenty of lapses. In early December their record was 12–9, as compared to 17–4 the year before. One challenging factor was a tough starting schedule that saw them play 14 of their first 22 games on the road, including 10 games against teams holding playoff spots in the standings. A stream of injuries also held the team back, including injuries to Ezeli, Douglas, and O'Neal. Most prominently of all, Iguodala suffered a hamstring pull in late November that kept him out for over a month; during this period, the Warriors' performance suffered significantly on both the defensive and offensive ends of the court and the team posted a losing 5–7 record while revealing a lack of bench depth. With Iguodala back in the lineup, the Warriors went on a 10-game winning streak that included six consecutive wins on a single road trip, tying an NBA record. The winning streak was the longest for the franchise since the 1975 championship year, and fell just one win short of the team record of 11 consecutive wins. To strengthen their underperforming bench, the Warriors made a three-team trade on January 15, sending Douglas to the Miami Heat and picking up guards Jordan Crawford and MarShon Brooks from the Boston Celtics. A day before the trade deadline, the Warriors traded Kent Bazemore and Brooks to the Los Angeles Lakers in exchange for veteran point guard Steve Blake. Boosted by the additions of Blake and Crawford and the play of 35-year-old Jermaine O'Neal (who returned sooner than expected from wrist surgery), the Warriors were one of the winningest teams in the NBA after the All-Star break. On April 11, in a 112–95 stomping of the Los Angeles Lakers at the Staples Center, the Warriors clinched a playoff berth in consecutive seasons for the first time since 1991 and 1992. However, just one day earlier in a loss against the Portland Trail Blazers, Andrew Bogut suffered a cracked rib that would keep him out of the post-season; the injury dealt a big blow to the sixth-seed Warriors' playoff hopes. Even as the team rolled towards the post-season, signs emerged of trouble in the Warriors' front office. On March 25, the team reassigned assistant coach Brian Scalabrine to the team's NBA Development League Affiliate in Santa Cruz because of what head coach Mark Jackson called a "difference in philosophies" and what unnamed league sources cited by Yahoo! Sports called "an increasingly dysfunctional atmosphere" on the Warriors' coaching staff. Fewer than two weeks later, assistant coach Darren Erman was fired for secretly recording conversations between coaches, staff and players. The Warriors ended the season with a record of 51–31. The team won more than 50 games for only the fourth time in franchise history, finished 20 games over .500 for the first time in 22 years, and tied the 1991–92 squad for the franchise's all-time mark of 24 wins on the road. Even without Bogut, the Warriors battled the third-seed Los Angeles Clippers to a seventh and deciding game in the first round of the playoffs before their 2013–14 season came to an end. It was season of many thrilling moments; the Warriors played in 17 regular-season games decided by two points or less, six games decided by winning shots in the final three seconds, and seven comeback wins in which the Warriors had been behind by 15 or more points. Curry also made his first appearance in the All-Star Game in 2014. Curry and Klay Thompson continued to set league records in three-point shooting. Curry, who finished the season with 261 threes, set an individual record for most three-pointers in a span of two seasons with 533, surpassing the previous mark of 478 set by Seattle Supersonic Ray Allen in 2004–05 and 2005–06. Together, Thompson and Curry combined for 484 threes on the year, besting by one the NBA record they had set the year before. Persistent reports that Mark Jackson's job as head coach was in jeopardy led Warriors players to make a unanimous declaration of support for Jackson only minutes after the Warriors' first-round playoff loss to the Clippers. Nonetheless, on May 6, 2014, the team announced that Jackson had been let go. In his three-season tenure as head coach, Jackson compiled a 121-109 (.526) record, overseeing a major turnaround. When Jackson took the helm in 2011, the franchise had made the playoffs only one time over the prior 17 seasons, averaging 30.2 wins per season during that period. Jackson, 49, became just the third head coach in franchise history to lead a team to at least 50 wins in a season, joining Don Nelson and Alvin Attles, who both hit the mark twice with the Warriors. With 121 wins overall, Jackson ranks fourth on the franchise's all-time wins list, trailing Attles (557), Nelson (422) and Eddie Gottlieb (263). On May 14, 2014, the Golden State Warriors signed Steve Kerr to a reported five-year, $25 million deal to become the team's new head coach. It was a first-time head-coaching position for Kerr, 48, a five-time NBA champion guard who set an all-time career record for accuracy in three-point shooting (.454). Kerr had formerly served as president and general manager for the Phoenix Suns basketball team (2007 to 2010), and had most recently been working as an NBA broadcast analyst for Turner Network Television (TNT). The Warriors also signed point guard Shaun Livingston and guard Leandro Barbosa during the offseason. The Warriors completed the 2014-2015 regular season with a league-best record of 67-15, setting a new record for most wins in franchise history. The Warriors also finished with a home record of 39–2, second-best in NBA history. The team ranked first in defensive efficiency for the season and second in offensive efficiency, barely missing the mark that the Julius Erving-led Sixers achieved by being first in both offensive and defensive efficiency. On May 4, Stephen Curry was named the 2014–15 NBA Most Valuable Player. Curry became the first Warrior to receive the award since Wilt Chamberlain received it in 1960. The Warriors swept the New Orleans Pelicans in the first round of the playoffs, defeated Memphis Grizzlies in six games in the second round, and dispatched Houston Rockets in five games in the Western Conference Finals. The Warriors advanced to their first NBA Finals since 1975. The team's opponent was the Cleveland Cavaliers, who would later go on to face the Warriors in each of the next three consecutive NBA Finals. After Golden State fell behind 2–1 in the series, Kerr gave swingman Andre Iguodala his first start of the season, replacing center Andrew Bogut in Game 4. The Warriors' small lineup (which came to be known as the Death Lineup) helped turn the series around. The Warriors defeated the Cavaliers in six games, and Iguodala was named Finals MVP. Kerr became the first rookie coach to win a title since Pat Riley in 1981–82. Other highlights of the 2014-2015 season included Stephen Curry breaking his own record for three-pointers made in a single season with 286. He and Klay Thompson made a combined 525 three-pointers, the most by a duo in NBA history. In the postseason, Curry shattered Reggie Miller's record of 58 made three-pointers in a single postseason with 98. On January 23, 2015, Klay Thompson broke an NBA record for points in a quarter with 37 in the third. Curry was also the leader in the voting polls for the 2015 NBA All-Star Game, won the 2014–15 NBA Most Valuable Player award and the 2015 ESPYs Best Male Athlete award. Draymond Green was an All-NBA Second Team member in 2015–16. On July 27, 2015, David Lee—who had lost his starting power forward job to Draymond Green during the season—was traded to the Boston Celtics in exchange for Gerald Wallace and Chris Babb; Golden State was seeking to offload his salary given his limited role on the team. The Warriors began the 2015-2016 season by winning their first 24 games, eclipsing the previous best start in NBA history. 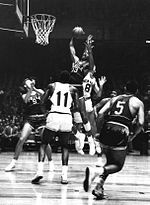 The Warriors surpassed the 1969–70 New York Knicks for the best road start in NBA history at 14–0, which is also the joint-third longest road win streak. Their record-setting start ended when they were defeated by the Milwaukee Bucks on December 12, 2015. The Warriors broke a 131-year-old record of 20–0 set by the 1884 St. Louis Maroons baseball team, to claim the best start to a season in all of the major professional sports in America. Golden State also won 28 consecutive regular-season games dating back to the 2014–15 season, eclipsing the 2012–13 Miami Heat for the second longest winning streak in NBA history. The team set an NBA record with 54 consecutive regular-season home wins, which spanned from January 31, 2015 to March 29, 2016; the previous record of 44 was held by the 1995–96 Chicago Bulls team led by Michael Jordan. On April 13, 2016, Golden State set the NBA record for most wins in a single season. The team finished the season with a record of 73–9. On May 10, 2016, Stephen Curry was named the NBA's Most Valuable Player (MVP) for the second straight season. Curry is the 11th player to win back-to-back MVP honors and became the first player in NBA history to win the MVP award by unanimous vote, winning all 131 first-place votes. Stephen Curry, Draymond Green and Klay Thompson were all named to the 2016 All-Star Game. Green broke the Golden State franchise record of nine triple-doubles in a season. 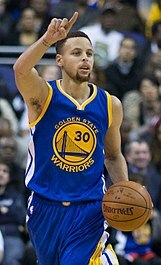 Curry broke numerous three-point records during the season, including his own NBA record for made three-pointers in a season of 286; he finished the season with 402 three-pointers. He made a three-pointer in 151 consecutive games, which broke the NBA record of 127 set by Kyle Korver in 2014. On February 27, 2016, Curry also tied the NBA record of twelve three-pointers made in a single game, jointly holding it with Donyell Marshall and Kobe Bryant. The Warriors reached the NBA Finals for the second consecutive year, facing a rematch against the Cleveland Cavaliers. The Warriors won three of the first four games of the 2016 NBA Finals, but the Cavaliers made a comeback to tie the series at three wins apiece. Draymond Green was suspended for Game Five of the series, and Curry was ejected from Game Six. In Game Seven, the Warriors lost the series on their home court, earning the unfortunate distinction of becoming the first team to lose the NBA Finals after having led three games to one. July 2016 featured a series of significant player transactions. On July 4, 2016, Kevin Durant announced he would leave the Oklahoma City Thunder to sign a two-year contract with the Golden State Warriors. On July 7, Durant signed his contract, which gave the Warriors a fourth All-NBA player on their team. The Durant signing made the Warriors prohibitive favorites to win the 2017 NBA championship, according to oddsmakers. On July 9, 2016, free-agent forward Harrison Barnes signed with the Dallas Mavericks. Centers Festus Ezeli and Marreese Speights left the Warriors for other teams, as did guard Leandro Barbosa. Center Andrew Bogut was traded, along with a future second-round pick, to the Dallas Mavericks in exchange for a future conditional second-round pick. Veteran power forward David West signed with the Warriors, as did free-agent center Zaza Pachulia. The Warriors posted many notable achievements during the 2016–17 regular season. On November 7, 2016, Stephen Curry set the NBA record for most 3-pointers in a game with 13, in a 116–106 win over the Pelicans. On December 5, 2016, Klay Thompson scored 60 points in 29 minutes, in a 142–106 victory over the Pacers. In doing so, Thompson became the first player in NBA history to score 60 or more points in fewer than 30 minutes of playing time. Stephen Curry, Kevin Durant, Draymond Green, and Klay Thompson were all named to the 2017 NBA All-Star Game, making the Warriors only the eighth team in NBA history to have four All-Stars. On February 10, 2017, Draymond Green recorded a triple-double with 12 rebounds, 10 assists, and 10 steals, becoming the first player in NBA history to post a triple-double with fewer than 10 points. On March 2, 2017, the Warriors' streak for most games without back-to-back losses ended at 146 with a 94–87 loss to the Chicago Bulls. The streak eclipsed the previous record of 95 held by the Utah Jazz. The Warriors earned home-court advantage throughout the 2017 playoffs, thanks to a 2016–17 regular season record of 67–15. They were the first team in NBA playoff history to start the playoffs 12–0, defeating the Trail Blazers, the Jazz, and the Spurs in consecutive series. The 2017 Finals once again pitted the Warriors against the Cavaliers, becoming the first time in NBA history that two teams met in the Finals for three consecutive years. The Warriors won the championship after going 4–1 in the Finals, and their 16–1 playoff record garnered the best winning percentage (.941) in NBA playoffs history. After the Warriors announced that they were uncertain if they would make the customary visit to the White House by playoff champions, President Donald Trump rescinded his invitation. The team still planned to travel to Washington, D.C. to "celebrate equality, diversity and inclusion." Planned activities included meeting with local youth and a visit to the National Museum of African-American History and Culture. The Warriors went into the 2018 playoffs as the second seed in the Western Conference after earning a 2017–18 regular season record of 58–24. After defeating both the Spurs and the Pelicans 4-1, the Warriors came up against the top-seeded Houston Rockets in the Western Conference Finals. Despite reaching a 3-2 disadvantage against the Rockets after Game 5, the Warriors staved off elimination and came back to win the series 4-3, winning the Western Conference for the 4th straight year. The 2018 Finals pitted the Warriors against the Cavaliers for the fourth consecutive season; this marked the first time in NBA history that the same two teams had met in the Finals for four consecutive years. The Warriors swept the Cavaliers to win their second straight NBA championship; previously, there had not been an NBA Finals sweep since 2007. Following the 2018 NBA Finals, writers for Sports Illustrated, USA Today, The Wall Street Journal, and the New York Daily News described the Warriors as a dynasty. In April 2014, the Warriors began the purchase process for a 12-acre (4.9 ha) site in Mission Bay, San Francisco, to hold a new 18,000-seat arena which is expected to be ready beginning with the 2019–20 NBA season, with construction to begin in early 2016. The sale was finalized in October 2015. The location was selected after an original proposal to construct the arena on Piers 30 and 32, just south of the Bay Bridge, met with vocal opposition due to concerns about traffic, environmental impacts and obstruction of views. The new location, which still faces some vocal opposition in San Francisco, apparently eliminates the need for any voter approval, which would have been required with the original site. Some type of waterfront park is planned across from the projected arena, which will be located at an already-existing Muni T-Third stop. The Central Subway, originally planned to open in 2018 and later postponed for 2019, may provide a direct connection between the new site and the downtown Powell Street Muni/BART station. Although the Warriors considered a name change, possibly returning to their former name of San Francisco Warriors, it was ultimately decided that they would remain the Golden State Warriors upon their return to San Francisco. On January 27, 2016, it was announced that the Warriors' new arena would be called Chase Center as part of an agreement with JPMorgan Chase. Approximately 32 months after the January 2017 groundbreaking, the Warriors are expected to take over full control of Chase Center from the two joint construction contractor firms responsible for the building of the arena and attached locations on August 1, 2019, with opening events the following month. While the Warriors and the Cleveland Cavaliers have played each other since the Cavaliers joined the NBA in 1970, the two teams' rivalry began to develop in the 2014–15 season when they met in the first of four consecutive NBA Finals. Previously, no pair of teams had faced each other in more than two consecutive Finals. The Warriors have won three of the four NBA Finals in which they faced the Cavs, winning in 2015, 2017, and 2018. Bob Fitzgerald has done television play-by-play, and former Warrior guard Jim Barnett has done color commentary for the Warriors for more than 15 years, currently on NBC Sports Bay Area, where they telecast more than 70 Warrior games a year. They also host Roundtable Live, a half-hour pre-game show leading up to the broadcast of select Golden State home games. Fitzgerald is in his 20th season as the Warriors' play-by-play man, while Barnett is in his 32nd season as color man. Greg Papa, Garry St. Jean, and Kelenna Azubuike are also members of the telecast team, specializing in in-game, halftime and post-game analysis, while Kerith Burke serves as the sideline reporter. Tim Roye has done the radio play-by-play for Warrior games since 1995. He is joined in the booth by former Warriors forward Tom Tolbert for home games only. On August 25, 2016, the Warriors announced they were leaving long time station KNBR and all of their games will be broadcast on KGMZ. After each game, Roye, Fitzgerald and Barnett get together for post-game radio analysis and a next-game preview. The Warriors hold the draft rights to the following unsigned draft picks who have been playing outside the NBA. A drafted player, either an international draftee or a college draftee, who is not signed by the team that drafted him, is allowed to sign with any non-NBA teams. In this case, the team retains the player's draft rights in the NBA until one year after the player's contract with the non-NBA team ends. This list includes draft rights that were acquired from trades with other teams. 1 Includes Chamberlain's tenure (1959–1962) in Philadelphia. 2 Includes Meschery's tenure (1961–1962) in Philadelphia. 3 Includes Attles' tenure (1960–1962) in Philadelphia. He also served as head coach (1969–1983). 4 Also served as general manager (2004–2009). Meschery, Attles, Barry, Thurmond and Mullin are also members of the Bay Area Sports Hall of Fame. 1 In total, Mullin was inducted into the Hall of Fame twice – as player and as a member of the 1992 Olympic team. 2 In total, Lucas was inducted into the Hall of Fame twice – as player and as a member of the 1960 Olympic team. 3 In total, Newell was inducted into the Hall of Fame twice – as contributor and as a member of the 1960 Olympic team. Arizin, Fulks, Gola, Johnston and Phillip played all or most of their tenure with the Warriors in Philadelphia. Rodgers' tenure was evenly divided between Philadelphia and San Francisco, and Chamberlain's and Attles' nearly so. King (Knicks), Lucas (Knicks), Parish (Celtics), Richmond (Kings), Sampson (University of Virginia and Rockets), White (Celtics), and Wilkes (Lakers) were elected mostly for their performances with other teams. Marčiulionis played most of his NBA career with Golden State, but his induction is also for his distinguished international career (Statyba, USSR, and Lithuania). Of those elected to the hall primarily as Warriors, only Thurmond, Barry and Mullin spent significant time with the team since the 1971 move to Oakland and the name change to "Golden State". ^ Philadelphia was 1947 league championship finalist—and won the inaugural 1947 BAA Finals—not as Eastern champion but as winner of the runners-up bracket. The Eastern and Western champions met in one best-of-seven semifinal series while four runners-up played best-of-three series to determine the other league finalist. The Warriors were second in the East, won the runners-up bracket, and defeated the Western champion Chicago. Next year the Baltimore Bullets won the runners-up bracket and defeated the Eastern champion Warriors in the 1948 BAA Finals. "1947–48 BAA Season Summary". Basketball-Reference.com. Retrieved March 1, 2015. ^ a b California made "The Golden State" its official state nickname in 1968. "California State Symbols". California State Library. May 10, 2015. Retrieved May 11, 2015. ^ a b After three seasons the eastern BAA merged with the older, midwestern National Basketball League (NBL) to create the NBA prior to the 1949–50 season. The NBA recognizes BAA history as the first stage of its own and begins its list of champions with the 1947 Warriors. "NBA Season Recaps". NBA History (nba.com/history). July 1, 2014. Retrieved June 24, 2015. ^ "Warriors All-Time Yearly Results" (PDF). Golden State Warriors 2017–18 Media Guide. NBA Properties, Inc. October 16, 2017. Retrieved April 5, 2018. ^ "History: Team by Team" (PDF). Official National Basketball Association Guide 2017–18. National Basketball Association. October 30, 2017. Retrieved April 5, 2017. ^ "NBA.com/Stats–Golden State Warriors seasons". National Basketball Association. Retrieved January 29, 2017. ^ "Golden State Warriors Unveil New Logo, Color Scheme And Branding Elements". Warriors.com. NBA Media Ventures, LLC. June 17, 2010. Retrieved June 8, 2017. The colors of the new logos and branding elements are Warriors Royal Blue and California Golden Yellow. ^ "Golden State Warriors Reproduction Guideline Sheet". NBA Properties, Inc. Retrieved February 8, 2018. ^ "Warriors and Rakuten Form Jersey Partnership". Warriors.com (Press release). NBA Media Ventures, LLC. September 12, 2017. Retrieved December 17, 2017. ^ Sherwood Strauss, Ethan (June 20, 2014). "To make splash, Dubs must break up duo". ESPN. Retrieved May 31, 2016. ^ Kale Williams; Jenna Lyons (April 14, 2016). "Warriors fans delirious after basking in historic night". San Francisco Chronicle. Retrieved May 31, 2016. ^ "Ranking 70 Greatest Backcourt Duos in NBA History". NBA.com. December 27, 2017. Retrieved February 23, 2019. ^ Barney, Chuck (December 21, 2018). "Warriors' Splash Brothers meet the Bad Boys in new TV special". The Mercury News. Retrieved February 23, 2019. ^ "Forbes Releases 2018 List Of The World's Most Valuable Sports Teams". Forbes. Retrieved September 30, 2018. ^ The Official NBA Basketball Encyclopedia. Villard Books. 1994. p. 29. ISBN 0-679-43293-0. ^ The Official NBA Basketball Encyclopedia,. Villard Books. 1994. p. 33. ISBN 0-679-43293-0. ^ "Behind The Name – Warriors". Retrieved May 15, 2016. ^ "Chamberlain scores 100 in 1962 game versus Knicks". National Basketball Association. March 2, 2013. Retrieved May 3, 2015. ^ "Rick Barry Bio". National Basketball Association. May 3, 2015. Retrieved May 3, 2015. ^ "Golden State Warriors 2014-15 Media Guide" (PDF). National Basketball Association. October 10, 2014. Retrieved May 3, 2015. ^ "Warriors Trade Mullin to Pacers". The New York Times. nytimes.com. Retrieved July 6, 2018. ^ Fainaru-Wada, Mark (February 10, 2002). "The man who owns the Warriors / Cohan's rocky reign / An era marked by lost games, lost fans and endless litigation". San Francisco Chronicle. ^ "Pacers make 8-player trade with Warriors". Indiana Pacers. January 17, 2007. Retrieved May 3, 2015. ^ Warriors@ Trail Blazers Recap On April 18, the Warriors clinched their first playoff berth since 1994 with a resounding 120–98 win in the regular season finale at Portland. ^ Thompson, Marcus, II (April 27, 2007). "Warriors fan is behind 'We Believe' campaign". Contra Costa Times. Archived from the original on July 17, 2007. ^ "ESPN Baron Davis Player Card". ESPN. April 13, 1979. Retrieved June 16, 2011. ^ a b "Stephen Curry NBA Stats". Basketball Reference. Retrieved January 2, 2016. ^ "Larry Riley Q+A: Getting to Know GState's GM". Retrieved March 30, 2012. ^ Simmons, Rusty (April 15, 2010). "Limp to Victory Is Fitting Finish". San Francisco Chronicle. ^ "Kings' Evans takes home T-Mobile Rookie of Year award". NBA Official Website. Archived from the original on June 10, 2016. Retrieved January 2, 2016. ^ "Lacob, Guber have deal to buy Warriors". Associated Press. July 15, 2010. ^ "Joe Lacob on the New Era Warriors: "Something very special is happening already" | Talking Points". Blogs.mercurynews.com. November 15, 2010. Retrieved June 16, 2011. ^ Torkelson, Tommy (September 23, 2010). "Don Nelson Out As Golden State Warriors Coach: Rapid Reaction". BleacherReport.com. Retrieved September 9, 2018. ^ Kawakami, Tim (February 27, 2011). "Breaking news: Warriors buy out Troy Murphy (and why it's a wise move)". San Jose Mercury News. Retrieved February 28, 2011. Murphy had to be waived before Tuesday to remain eligible for a playoff roster on a new team. CLARIFICATION: There is a later deadline for signing with a new team. ^ "Warriors, Murphy reach buyout agreement". National Basketball Association. Associated Press. February 28, 2011. Archived from the original on March 3, 2011. Retrieved February 28, 2011. ^ "Stephen Curry Wins 2010–11 NBA Sportsmanship Award". NBA.com. May 5, 2011. Retrieved January 3, 2016. ^ "Warriors Name Mark Jackson Head Coach". Golden State Warriors. June 6, 2011. Retrieved June 16, 2011. ^ Simmons, Rusty (June 24, 2011). "Warriors pick a 2-guard: Klay Thompson". SFGate.com. Retrieved September 10, 2018. ^ "Stephen Curry of Golden State Warriors to miss rest of preseason – ESPN". Espn.go.com. October 20, 2012. Retrieved April 9, 2013. ^ a b c Slater, Anthony (February 4, 2016). "OKC Thunder: How the 2012 offseason allowed the Warriors to eventually leapfrog the Thunder in the NBA pecking order". NewsOK.com. Retrieved September 10, 2018. ^ "Stephen Curry lands $44M contract extension". Yahoo! Sports. October 31, 2012. Retrieved February 15, 2015. ^ McIntyre, Jason. "Three Years Ago, Here's What Basketball Writers Were Saying About Stephen Curry's Ankle and His Future with the Warriors". The Big Lead. Retrieved January 3, 2016. ^ "Warriors head to Denver lacking playoff experience". NBA. April 18, 2013. Retrieved April 27, 2013. ^ "Splash Brothers Take On the World". Golden State Warriors. October 17, 2014. Retrieved October 17, 2014. ^ "Origin of Stephen Curry's and Klay Thompson's 'Splash Brothers' nickname". Yahoo! Sports. February 13, 2015. Retrieved February 13, 2015. ^ Tafur, Vic (July 5, 2013). "Warriors Make Trade Agree to Deal with Iguodala". The San Francisco Chronicle. Retrieved July 5, 2013. ^ "Golden State Warriors get guard Nemanja Nedovic with 30th pick in draft". mercurynews.com. ^ Gonzalez, Antonio (July 8, 2013). "AP Source: Warriors to sign Marreese Speights". The San Francisco Chronicle. ^ Young, Royce (July 9, 2013). "Report: Jermaine O'Neal, Toney Douglas to Sign with Warriors". CBS Sports.com. ^ "B&H Basketball Player Ognjen Kuzmić is the New Player of the Golden State Warriors". Sarajevo Times. ^ "Golden State Warriors closing in on being a defensive power". mercurynews.com. ^ JayPatt. "Bosnian center Ognjen Kuzmic signs with Warriors, according to report". SBNation.com. Vox Media. ^ "Boston Celtics trade Jordan Crawford, MarShon Brooks to Golden State Warriors". ESPN.com. ^ "Warriors acquire Steve Blake from Lakers". The San Francisco Chronicle. February 19, 2014. Retrieved April 15, 2015. ^ Simmons, Rusty (March 27, 2014). "Assistant Scalabrine reassigned after clash with Jackson". The San Francisco Chronicle. Retrieved May 3, 2015. ^ "Warriors coach Mark Jackson forces reassignment of assistant Brian Scalabrine". Yahoo! Sports. March 25, 2014. ^ "Report: Darren Erman fired from Warriors for secret recordings". CBSSports.com. ^ "2013-14 Top Games: Part 1". Golden State Warriors. May 3, 2015. Retrieved May 3, 2015. ^ "Warriors' players fully support their coach". SFGate. ^ "Mark Jackson fired by Golden State Warriors". Golden State Warriors. ^ Zach Buckley. "Golden State Warriors Firing Mark Jackson Would Be Massive Mistake". Bleacher Report. ^ "Warriors Relieve Head Coach Mark Jackson of His Duties". Golden State Warriors. May 6, 2014. Retrieved May 3, 2015. ^ "Steve Kerr accepts reported five-year, $25M offer from Warriors". CBSSports.com. ^ "Warriors Sign Free Agent Shaun Livingston to Contract". Golden State Warriors. ^ "Warriors Sign Leandro Barbosa to Contract". NBA.com. September 10, 2014. Retrieved September 11, 2014. ^ "Golden State Warriors Franchise Index". Basketball Reference. Sports Reference LLC. Retrieved June 21, 2015. ^ Holmes, Baxter (June 16, 2015). "Iguodala NBA's no-stats Finals MVP?". ESPN.com. Archived from the original on June 16, 2015. ^ Strauss, Ethan Sherwood (June 16, 2015). "Andre Iguodala named Finals MVP after coming off bench to begin series". ESPN.com. Archived from the original on June 17, 2015. ^ Holmes, Baxter (June 17, 2015). "Finals recap: The Warriors' road to the title". ESPN.com. Archived from the original on June 17, 2015. ^ Thompson II, Marcus (April 3, 2015). "Thompson: Golden State Warriors' David Lee has taken one for the team". San Jose Mercury News. Archived from the original on May 27, 2015. Retrieved May 27, 2015. ^ "Warriors' David Lee adjusts to new role coming off the bench". USA Today. Associated Press. March 17, 2015. Archived from the original on May 27, 2015. Retrieved May 27, 2015. ^ "Boston Celtics Acquire David Lee". NBA.com. July 27, 2015. Retrieved July 27, 2015. ^ Forsberg, Chris (July 7, 2015). "Breaking down the David Lee deal". ESPN. Retrieved July 27, 2015. ^ "Warriors Make History With 16th "Straight Win"". New York Times. November 25, 2015. ^ a b "Best NBA starts". basketball-reference.com. Retrieved November 24, 2015. ^ "Longest Road Win Streaks". basketball-reference.com. Retrieved December 29, 2015. ^ "It's Over". NBA.com. December 12, 2015. ^ "Longest Home Win Streaks". basketball-reference.com. Retrieved December 29, 2015. ^ "Grizzlies vs. Warriors - Game Recap - April 13, 2016 - ESPN". ESPN.com. April 14, 2016. Retrieved April 14, 2016. ^ "Stephen Curry Named 2015-16 Kia NBA Most Valuable Player". Warriors.com. May 10, 2016. ^ "NBA Individual Regular Season Records for 3-Point Field Goals". basketball-reference.com. Retrieved April 1, 2016. ^ "Warriors Advance to Second Consecutive NBA Finals – Golden State Warriors". ^ "Game 6 of the NBA Finals as it happened". ^ a b Neuharth-Keusch, AJ (June 11, 2018). "Chronicling the Warriors' incredible, but rocky, rise to dynasty status". USA Today. Retrieved September 10, 2018. ^ Gallo, D. J. (June 20, 2016). "Cleveland Cavaliers beat Golden State Warriors: NBA finals Game 7 – as it happened". ^ "Kevin Durant to sign with Warriors". ESPN. July 4, 2016. Retrieved July 8, 2016. ^ "Warriors Sign Free Agent Forward Kevin Durant". NBA.com. NBA Media Ventures, LLC. July 8, 2016. Retrieved July 9, 2016. ^ "Durant Effect: Warriors heavy 2017 favourites". July 5, 2016. Retrieved July 9, 2016. ^ "Mavericks sign forward Harrison Barnes". mavs.com. July 9, 2016. Retrieved July 9, 2016. ^ "Done deal: SF Harrison Barnes signs four-year, $94 million deal with Mavericks". DallasNews.com. July 6, 2016. Retrieved July 6, 2016. ^ "Trail Blazers Sign Festus Ezeli". Portland Trail Blazers. ^ "CLIPPERS SIGN MARREESE SPEIGHTS". NBA.com. July 12, 2016. Retrieved July 12, 2016. ^ "Suns Sign Leandro Barbosa". NBA.com. July 19, 2016. Retrieved July 19, 2016. ^ "Mavericks acquire center Andrew Bogut from Warriors". mavs.com. July 7, 2016. Retrieved July 7, 2016. ^ "Warriors Sign Free Agent Forward David West". NBA.com. July 9, 2016. Retrieved July 9, 2016. ^ "Warriors Sign Free Agent Center Zaza Pachulia". NBA.com. July 12, 2016. Retrieved July 12, 2016. ^ McCauley, Janie (November 8, 2016). "Stephen Curry hits NBA-record 13 3-pointers". NBA Media Ventures, LLC. Associated Press. Retrieved June 20, 2017. ^ Mather, Victor (December 6, 2016). "Klay Thompson Pours In 60 Points, in Just 29 Minutes". The New York Times. Retrieved June 20, 2017. ^ "Four all-stars?!? Warriors join rare NBA company". Mercury News. January 26, 2017. Retrieved June 20, 2017. 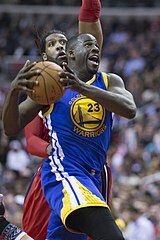 ^ "Warriors' Draymond Green records one-of-a-kind triple-double with rebounds, assists and steals". NBA Media Ventures, LLC. February 10, 2017. Retrieved June 20, 2017. ^ "Warriors' historic streak snapped with loss to Bulls". San Francisco Chronicle. March 2, 2017. Retrieved June 20, 2017. ^ Purdy, Mark (June 13, 2017). "Purdy: Put a pause on the dynasty talk–and just enjoy this Warriors title". Mercury News. Retrieved June 19, 2017. ^ David, Javier (September 23, 2017). "Trump takes on Stephen Curry and Colin Kaepernick — and the sports world hits back". CNBC.com. Retrieved March 4, 2018. ^ Savransky, Rebecca (February 27, 2018). "Golden State Warriors to swap White House visit for trip to African-American History museum". TheHill. Retrieved February 28, 2018. ^ Smith, Sekou (June 9, 2018). "A Golden Era: Warriors clean up Cavaliers with a sweep, capture third NBA title in four years". NBA. Retrieved June 10, 2018. ^ Golliver, Ben (June 9, 2018). "The Warriors' Dynasty May Annoy Some, but It Isn't Ending Anytime Soon". Sports Illustrated. Retrieved September 10, 2018. ^ Neuharth-Keusch, AJ (June 11, 2018). "Why the Defining Game of This Golden State Warriors Dynasty Was a Loss". The Wall Street Journal. Retrieved September 10, 2018. ^ Cohen, Ben (June 7, 2018). "Phillips: The Golden State Warriors' dynasty isn't as stable as you think". New York Daily News. Retrieved September 10, 2018. ^ Rohrbach, Ben (August 30, 2018). "David West retires from the NBA an All-Star, champion and unquestioned leader". Yahoo.com. Retrieved August 30, 2018. ^ Witt, Brian (August 30, 2018). "Going Out On Top: David West Retires After 15-Year Career". NBA.com. Retrieved September 3, 2018. ^ "Warriors shift arena plans to Mission Bay". SFGate. ^ "New San Francisco Golden State Warriors arena Chase Center". KRON4. ^ Diamond Leung (April 15, 2015). "Warriors expect to break ground on new San Francisco arena in 2016". Retrieved April 15, 2015. The Warriors are hoping to break ground on their new arena project shortly after the start of 2016 and have the venue completed in July or August 2018, team president Rick Welts said Tuesday. ^ "Warriors formally purchase Mission Bay site". SFGate. October 12, 2015. Retrieved May 9, 2016. ^ Knight Perrigan, Heather (May 22, 2012). "Golden State Warriors owners make a risky play". The San Francisco Chronicle. Retrieved May 22, 2012. ^ "Board gives Warriors' arena initial green light". The San Francisco Chronicle. ^ Feldman, Dan (April 25, 2014). "Golden State Warriors consider name change". NBC sports. Retrieved April 15, 2015. ^ Blackburn, Pete (April 4, 2018). "Golden State Warriors confirm they won't change name when moving to San Francisco before 2019-20 season". CBSSports.com. Retrieved April 11, 2018. ^ "Future Warriors arena to be named Chase Center". NBA.com. Retrieved January 28, 2016. ^ a b Leuty, Ron (January 22, 2019). "Inside the final quarter of construction at the Warriors' new Chase Center". San Francisco Business Times. American City Business Journals. Retrieved February 5, 2019. ^ "Bob Fitzgerald". Golden State Warriors. October 28, 2010. Retrieved June 16, 2011. ^ "KERITH BURKE JOINS NBC SPORTS BAY AREA AS GOLDEN STATE WARRIORS SIDELINE REPORTER". NBCS Bay Area. October 11, 2017. ^ Saracevic, Al (August 25, 2016). "Warriors drop KNBR, head to 95.7 The Game". The San Francisco Chronicle. Retrieved March 7, 2018. ^ Dineen, J.K. "Warriors arena to be named Chase Center — bank buys naming rights". SFGate.com. Retrieved January 27, 2016. Wikimedia Commons has media related to Golden State Warriors.